There are days that you start thinking about something and it will just not go away. Well, today is one of those days. I was talking to a Native American on ICQ the other night and what is below has been on my mind every since. In case for those who do not know Native Americans are Indians (as in Cowboys and Indians). I only say this as I was asked the other night if Native American meant Indians. The following is only my opinions and yours may not be the same but I hope you will read anyway. Native Americans were here before the United States was ever thought about. For just a second think about how you would feel if some one came in and stole your life from you, taking your idenity, your land, your home, your religion, your food, and killed members of your family, everything that made you who you are. That is what our forefathers did to this great race of people. We could have learned many things from the Native Americans. But it was a choice made by our forefathers not to learn. This great race of people had a way of life that compares to no other. They are a very religous group of people and to try to change that was wrong. But don't we still do that in our society today. They were called "Heathens" because we did not understand and never really learned to understand. Their children were taken from them and forced into lives worse than death. Their hair was cut, they were forbidden to speak their native tongue. They were beaten, some were raped, and many died, all in the name of religion. 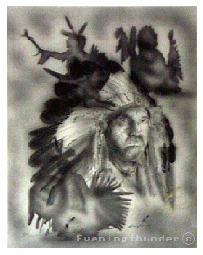 Native Americans have a religion that bypasses any religion we have. Their stories of the Creation are like ours but with their own interpretations of it. They believed the Creator gave them the things they needed to live. But isn't that what we beleive. they said a prayer and thanked the animals they killed and the plants and trees they took. They did not kill all the animals in a herd nor did they take all the trees or plants from one place. They only took and used what they needed. And they used all of the animal they killed. All of this done in their way of religion. We don't do that, we take and kill and destroy and never think about saying a prayer or even think about taking only what we need. And again we could have learned alot from this great race. Our fore fathers chose not to learn and people, land and animals were destroyed and made almost extinct. This great race of people were and are great story tellers and artists. There are many great artist today. Their stories and art can be seen on the net. There is a link to a site that has most of the sites and links to them on it. You will find it at the end of this page. This is my opinion of a people so great and misunderstood and destroyed. The two links below will help you find almost anything you want to know about these Great People.